A GDevelop account is needed for a few features, notably the one-click export of your game for Android and iOS, Windows, macOS and Linux. In the window, you can see your profile (or create one if you don't have an account) and also see the last usages you've done of the online services. Select/click on Create my account. Enter your email address and choose a password. Once you're logged into your account, you can see your profile. 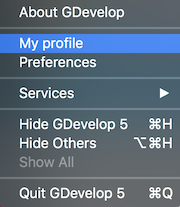 You can then use GDevelop specific services. 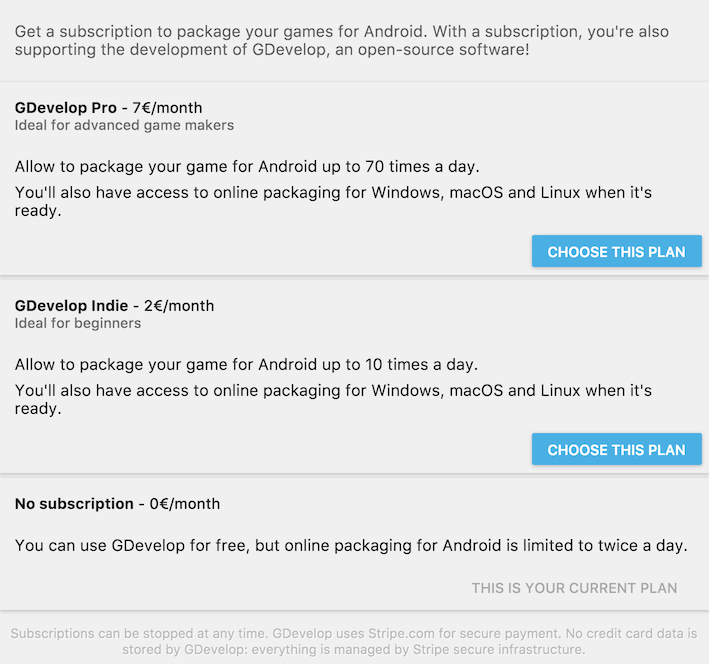 Services like packaging your game for Android with one click! By default, accounts are free. There are no limits on the games that you create with GDevelop. A few online services are limited. Limited services rely on servers that can be costly. In particular, with a free account you can create 2 packages for Android each day. Once you've clicked on “Choose this plan”, you'll be asked for your credit card number so that the subscription can be paid each month. Payments are transacted and encrypted using Stripe.com, which is the new standard in online payment. Everything is secured and handled by the Stripe infrastructure. If you want to update your subscription, either to upgrade to a subscription with more packagings or to a subscription which is cheaper, just open again your profile and click on Upgrade/Change. The next payment will automatically be adapted to your new subscription! Cancelling your subscription at any time is easy: open again your profile and click on Upgrade/Change. Choose the Free subscription and your current subscription will be stopped, and no new payment will be required. If you want, you can later subscribe again to another subscription. In any case, you won't lose any of your game or work!